A steamy cup of java on a crisp, quiet morning is just about the perfect start to any day in the wilderness. And a warm meal at the end of a long day on the trail is pretty tough to beat as well. Backpacking stoves can enhance your wilderness adventures in a way that few other tools can. Backpacking stoves have gotten increasingly light and convenient over the past few years.These stoves can be good choices for long-distance backpacking and also for home emergency kits. 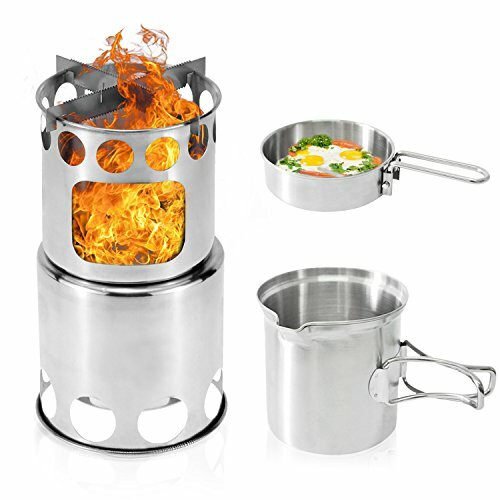 The lightweight henscoqi cooking stove is made with premium grade stainless steel, The portable camp stoves Pot is the companion pot crafted specifically for use with ultralight stove. When nested,folding stove pot fits inside the camp stoves pot for easy storage. 2.Multi-function lid:This is a lid with a handle and a small pan,Make sure you also have delicious meals outdoors. 4. OZ/ML Volume Markings:Allows for accurate measuring. 1. please clean the stove in time after burning and Keep away from damp conditions for lasting lifetime. 2.Do not cook inside tents or enclosed spaces. This can cause carbon monoxide poisoning and create a high fire risk. ✔【CROSS BAR - STABLE AND SAFETY】: The camping stove set-up with cross bar supporting arms can support stably a pot,pan or small cups, cross bar will more stable than 3-arms base. 30 OZ stainless steel cup come with a eagle mouth, it more easily to pour out and keep safety. ✔【FAST BOILING - EASY WASH】: Boils water(25 Oz) in 8 mins; Cooks vegetable in 10 min ( boiling and cooking time should consider about your fuel and weather condition). Created with 304 stainless steel, easy to wash cleanly with some soda even become dirty under pan/cup bottom.Please do not wash it by wash-machine. ✔【ENVIRONMENTAL FRIENDLY】: Just get leaves, twigs and wood of dead trees from nature as a fuel.No worry about using out, free up more space in your backpack and no need to carry heavily, pollution and expensive canister fuels that guard the environment and save your money. ✔【COMPACT- LIGHTWEIGHT】: With a compact size (0.57lb/5.1"*4") design, easy to carry and quick to assemble and disassemble almost anywhere you want go with mesh bag for Camping, Hiking, Backpacking, BBQ, Wilderness Survival etc. Also you can put some solid or gas fuel, lighter on wood burning space. ✔【DOUBLE WALL - LESS SMOKE】:Kekilo backpacking stove designed with double wall, 360 surrounding holes around the stand wall, and holes on the button make stove full of oxygen to creates ultra-clean gasification and a secondary combustion. This allows the fire to burn more complete which is why there is very little smoke during full burning. Wood stove with open mouth design, easy to add fuel. Get rid of inconvenience of keep lifting up the cooking pot/pan to add more fuel when using wood stoves. If you have any questions about this product by KekiloDirect, contact us by completing and submitting the form below. If you are looking for a specif part number, please include it with your message.